What is IBM Security Guardium Analyzer? Guardium Analyzer is a software-as-a-service offering that helps users efficiently find regulated data (such as PII, personal and sensitive personal data, and more), understand data and database exposures, assess risk, and act to address issues and minimize risk. How does IBM Security Guardium Analyzer work? It applies next-gen classification, as well as vulnerability scanning, to uncover risks associated with data in cloud-based and on-prem DBs. It then applies risk scoring to these results to identify and prioritize DBs that may be most likely to fail an audit, so you can act to minimize risk. What data sources does Guardium Analyzer scan? Today, Guardium Analyzer supports the following on-premises and cloud databases: IBM Db2, IBM Db2 for i, Oracle, Microsoft SQL Server, and MySQL. More platforms will be added over time. Are the classification and vulnerability scans one scan, or separate scan? Can this be changed? The goal of a scan is to create a risk assessment based on the amount of regulated and/or sensitive data in the environment combined with the vulnerabilities found in each DB. Because of this, the classification and vulnerability results are tied together and may not be separated. How do you take care of non-supported DBs? There is no option to add drivers or connections for unsupported DBs - we will be adding support for more DBs as we go. For a full list of supported platforms, refer to: the IBM Security Guardium Analyzer Knowledge Center. Can custom connections be developed for non-supported DBs? If customers connect to non-supported DBs, the scan results likely will not be accurate because the database may not be getting the latest security patches and updates, and IBM cannot provide support or product updates specific to those databases. Can Guardium Analyzer scan data hosted by cloud vendors (such as data in AWS, Azure, etc)? It can scan DBs installed on an IaaS solution, such as a cloud vm. We also support AWS RDS Oracle. Guardium Analyzer may work with other databases hosted by a cloud provider, but they are not officially supported today. For a full list of supported platforms, refer to the knowledge center. How is Guardium Analyzer's classification methodology different than what's been in the market? Guardium Analyzer's classification method provides next generation classification with higher levels of accuracy than catalog-based search and regular expression, because its rules can be more expressive and it validates matches using a checksum algorithm. Is IBM Security Guardium Analyzer the same as Guardium Data Protection? No, these offerings are not the same. Guardium Analyze is not a substitute for data activity monitoring, file activity monitoring, or masking, blocking, or alerting data protection capabilities. 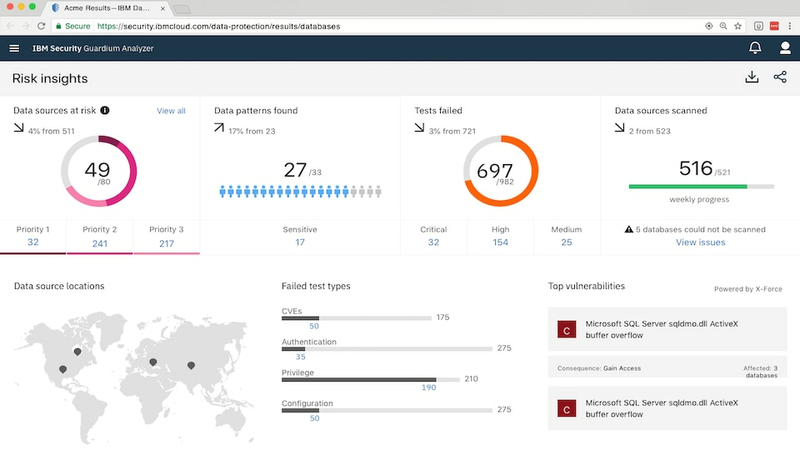 How is Guardium Analyzer different from Guardium Vulnerability Assessment? What do I need to have to use Guardium Analyzer? You need to have access to a Windows-based server to run the downloaded IBM Security Guardium Data Connector, which will connect to your databases and to Guardium Analyzer. You also must have user-level access to the databases you wish to connect. Where can I find documentation for Guardium Analyzer? You can find product documentation and more at the IBM Security Guardium Analyzer Knowledge Center. What do I need to have to successfully setup the Guardium Analyzer trial? To successfully set up the trial, you need to have: database access privileges to scan the desired database(s) AND access to a Windows machine, to download and run the IBM Security Guardium Data Connector. What is the ideal set up recommendation for the best Guardium Analyzer trial experience? We recommend using Google Chrome for accessing Guardium Analyzer. As mentioned above, users also must have access to a Windows machine to download and run the Data Connector, as well as user entitlement to connect to and scan their databases. What languages does the Guardium Analyzer classification engine support? Today, the Guardium Analyzer classification dictionary supports English, French, German, Spanish, Italian, and Japanese. Additional languages will be added over time. What languages is the Guardium Analyzer globalized and translated into (the product itself, the UIs, etc)? Guardium Analyzer went live in English, and it has been globalized and translated for French, Spanish, German, Japanese. Additional languages will be added over time. What kind of access do I need to add or remove custom data classification patterns? To add or remove custom data classification patterns, you must first be subscribed to either the Guardium Analyzer Professional Plan or the Guardium Analyzer Trial. How can I add custom data classification patterns to Guardium Analyzer? You can add either a regex- or dictionary-based custom pattern to your classification library by going to Settings --> Manage Patterns --> Add Pattern, and then follow the prompts. How can I delete custom data data classification patterns from Guardium Analyzer? To remove a custom pattern, go to Settings --> Manage Patterns, and click on the pattern you want to remove. Then, select either 'Delete' (the Trashcan icon) or 'Disable' from the blue bar at the bottom of the screen. Does Guardium Analyzer move any of my regulated data to the cloud? No. Guardium Analyzer does not move any regulated data to the cloud. Guardium Analyzer scans for regulated data and vulnerabilities in your databases, but only the results and insights gains are sent to the cloud-based Guardium Analyzer dashboard. What data is being sent to cloud from the connector? What parameters are sent? Are they sent securely? All communication is over HTTPS/TLS only. The data returned is only metadata: table name, column name, name of pattern found (e.g. tb_employees.emp_name: "First Name"), and any VA test that failed (ID only). How is the data about DBs stored on the connector? What if sensitive information is gathered through the scan? The connector stores only the connection data (db type, port/ip user/password) in a local encrypted database. No scan data is saved. What technology is the new data classification engine in Guardium Analyzer based on? The new classification engine is based on an IBM Research asset called System T. System T has been proven as part of IBM Watson offerings, and now we are embedding it in Guardium Analyzer. System T does not involve or include machine learning or artificial intelligence. What does the IBM Security Guardium Data Connector do? The Data Connector is provided with the Guardium Analyzer service, and it helps clients efficiently connect to their cloud and on-premises databases to uncover regulated data and vulnerabilities related to that data. For more details about the Data Connector, watch this short video. How long will it take me to download the Data Connector? It can take a few minutes to download the Data Connector. In some regions of the world, it may take up to 10 minutes to download the Data Connector (depending on internet connectivity and speeds). How do I install the Data Connector, and where does it sit? Install the connector on a Windows-based server within your local data center. After it is installed it will be able to connect to your databases and to Guardium Analyzer. DO NOT install the Data Connector on the database server(s). Think of it as a secure gateway to the service. What is the ideal configuration for the Data Connector? Are there any other specifics that can help me maximize performance? How many DBs can be connected to one connector? At what point do you recommend installing another connector? We recommend connecting no more than 100 DBs to a single Data Connector. You should install additional connectors after that point.